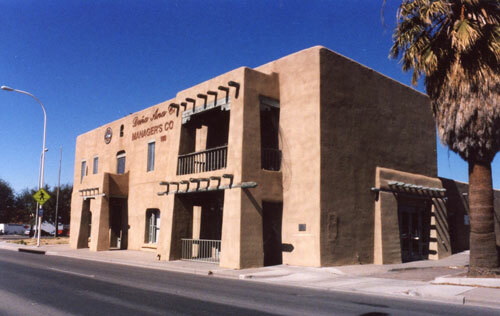 The 2-story adobe Amador Hotel is a special landmark for the city of Las Cruces. The exact 19th-century construction date is not known. Well-known pioneer, freighter, farmer, and businessman Martin Amador added the second story in 1885. Four generations of the Amador family provided a unique and beautiful venue for local, national, and international visitors. Cornerstones Community Partnerships prepared the initial Conditions Assessment in 2009. An Historic Structures Report and Preservation Plan under preparation by TimeSprings, Inc. and Jonathan S. Craig Architect, LLC nears completion. As a rare surviving example of one of the earliest known luxury hotels in the state, work is currently underway to nominate the Amador Hotel to the National Register of Historic Places. Several legislative capital outlays have resulted in the restoration of the lobby columns and the remediation of hazardous materials. The selective removal of contemporary materials that concealed vintage trims, wallpapers, and architectural features is nearly finished. Additional municipal and private funding is needed to return the Hotel to its Territorial-style heyday (1910 – 1945). Plans call for the Amador Hotel to be authentically rehabilitated for use as a multi-faceted events center and downtown destination featuring a museum component, vintage furnishings, dining capabilities and overnight lodging for themed events. For more information, please visit the Amador Hotel Foundation Board at www.amadorfoundation.org.